One of 303 Dodge Airflow trucks built, this truck was one of an order of 75 built for Texaco in 1939 - 1940. 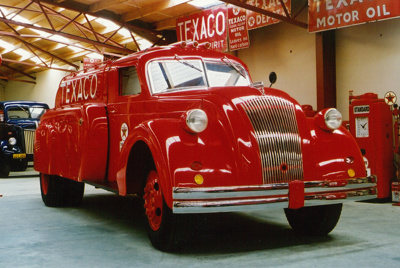 This was the 4th last Airflow Dodge built, completed in February 1940. It went to a contracting company and was used as a water cart before going to the wreckers. It was bought by Louis Wright a tanker truck operator from Chicago who intended to restore it but didn't. Bill Richardson bought it in January 1992 and finished it's restoration in December 1996.